Idara Taleem-o-Aagahi (ITA) alongside A World At School (AWAS) have kickstarted a global movement named ‘Up for School’ designed to collect signatures and put forth the world’s largest petition geared towards getting children in schools all across Pakistan. 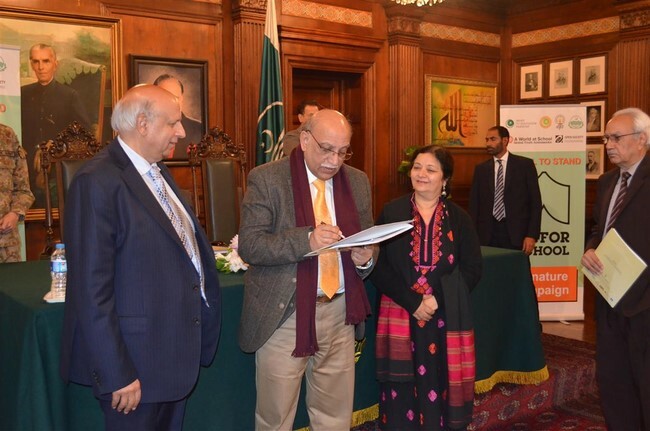 In order to facilitate this vision The Governor of Punjab – Mr. Mohammad Sarwar and Mrs. Baela Raza Jamil -Trustee/Advisor ITA – therefore arranged a press briefing on the ‘Up For School’ Signature Campaign and its action plan thereof, at the Governor House, Lahore on January 10, 2015. The Governor kindly opened his house and the floor for this cause to be discussed and propagated further.